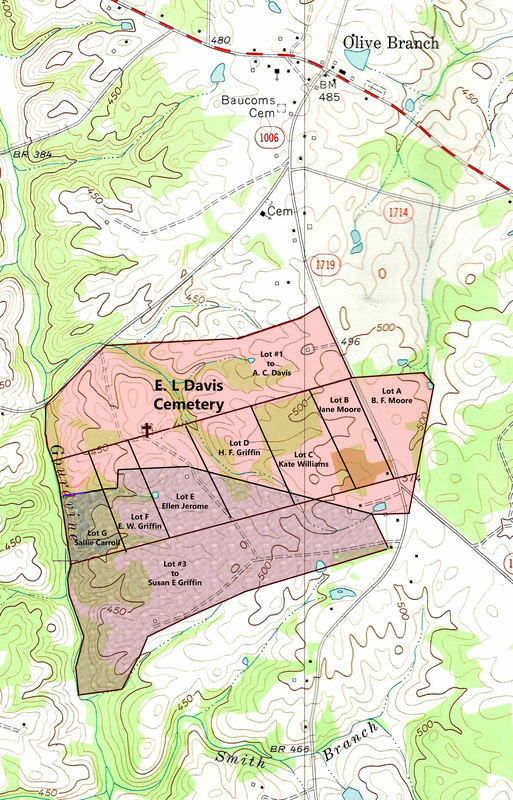 The Edmond L. Davis cemetery is located on a hilltop just east of the bridge where Olive Branch road crosses Gourdvine Creek in Union county NC. I remember Thanksgiving weekend 1996 and a visit to the Edmond L. Davis cemetery in Union county to photograph family lands I had only recently learned about. It was dreary, cold to the bone, and yet the frequent sounds of gunshot rang out as hunting season was in full swing. My father had passed less than a year prior and here I was alone in a cemetery seeking to lay witness to my GGG grandfather Ananias Thomas’ grave. I found his hand-carved stone which appeared to be grouped in a plot amongst other members of Thomas family. And just behind his grave were two unmarked stones that some have identified as mere foot markers. However, it’s always been my belief the stones mark the resting places of my GG grandparents David Thomas and his wife Alice Newsome Thomas. David is the son of Ananias. 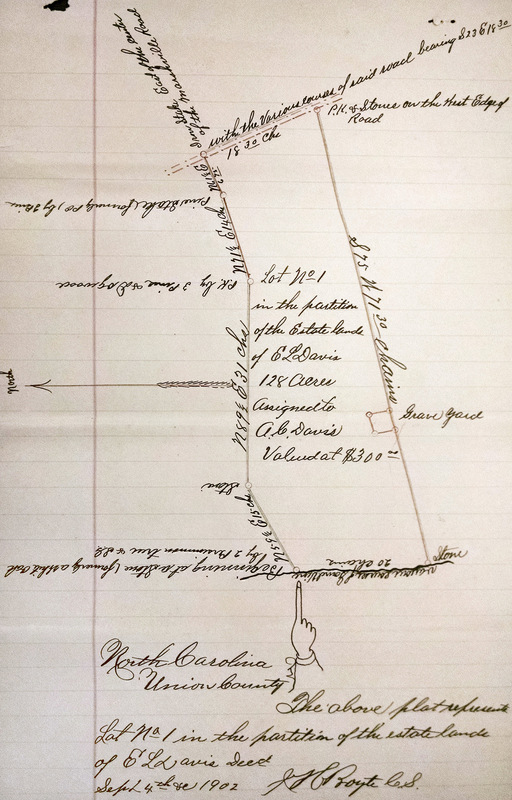 Both David Thomas and his father-in-law Joseph Newsome owned land along Gourdvine creek in the vicinity of present day Edmond L. Davis cemetery. Prior to his death ca. 1843, Joseph Newsome sold some of his land to David Thomas. Per bible record, Joseph’s daughter Alice Thomas died 3 Dec 1852 and Union county probate records indicate David Thomas died prior to 1855. Following the death of David and Alice Thomas, Edmond Davis was appointed estate administrator . He was also named guardian of the younger children including my namesake ancestor George Thomas. In the Fall Term 1856 of the Court of Equity for Union County, C. M. McCauley ordered the sale of 268 acres. Known as lot 1 of the “land upon which David Thomas lived at the time of his death”, this tract was situated on the south side of Gourdvine Creek. It adjoined David Thomas’s second tract and the lands of Elbert W. Caraway and Edmond Davis. On 30 Dec 1856, Edmond L. Davis purchased the land for $1,325. Important! Following Edmond Davis’ eventual death on 6 Jan 1896, lot 1 of his own estate takes in the cemetery that now bears his name (see plat above) . The tract matches and therefore can be accurately located using county GIS land records. Edmond Lilly Davis was a prominent Baptist minister in a region historically dominated by Baptists. His life and services are well documented in E. M. Brook’s 1928 History of Rocky River Baptist Church. 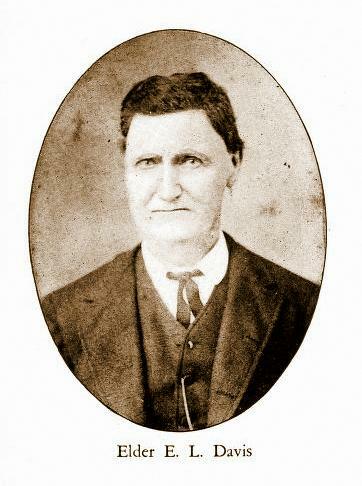 Edmond Davis was also a friend and brother in-law to David Thomas as he married Mary Elizabeth Newsome, a sister of David Thomas’ wife Alice. Note that David Thomas owned 660 acres per the 1852 Union county tax list at a time when Edmond Davis was listed with less. Following the death of David Thomas, the numbers reverse with David’s ownership of course going to zero. From this I’ve always wondered if the cemetery was built on lands that once belonged to David Thomas and/or his father-in-law Joseph Newsome? The following plat locates the entire estate of Edmond Davis. Note the portion highlighted in purple identifies the one lot Edmond Davis purchased from the estate of David Thomas. At this point, after nearly 20 years of looking, I still cannot say with absolute certainty that the graveyard in question was first located on David Thomas’ home land. But we know his lands were oh so close as were his father-in-law’s. And knowing there are no graves marking the resting place of David and Alice Thomas, my mind goes back to something Ms. Annie Lee Traywyck once told me: “The cemetery once had many more stones that eventually went the way of cows”. And then there are the two stones behind those of Ananias and his wife Sarah. Stake-like in form and made of a much harder granite, was there ever even clear writing on the stones? Is it just my wishful thinking? And note that Olive Branch Baptist Church just up the road was formed by Edmond Davis and others in 1858 just as the estate of David Thomas was being settled? Before Olive Branch Baptist, where did the folks along Gourdvine creek go to congregate and seek spiritual comfort? Where there’s more than two gathered, there would have been church. Where was it? This entry was posted in Benjamin Thomas of Anson NC, Thomas, Uncategorized and tagged Early Baptist churches, Gourdvine Creek, Olive Branch NC, Thomas Family History on December 6, 2015 by geothos.